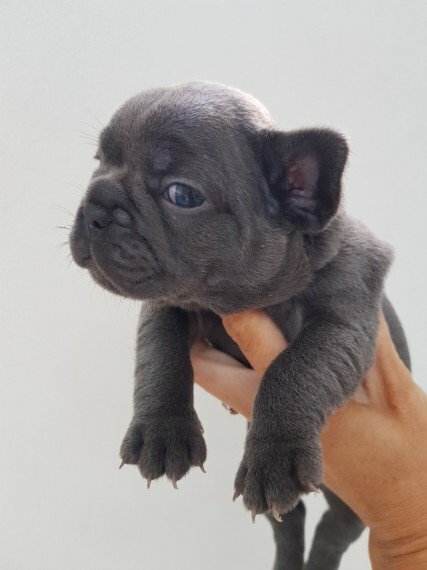 We have available to reserve 5 beautiful blue french bulldog puppies. All pups are KC registered and are being bought up in our busy household do will be used to the hustle and bustle of family life. Mum is our beautiful blue girl. Demi and dad is the gorgeous ..Huntsman.. from Van.Tastic Pooches LTD. Both parents are health tested and are CMR1. DM. HUU . JHC clear. which means all pups will also be clear of these. Pups will be ready to leave for their forever homes at 8 weeks old on the 19th of October. Pups will come with . . 5 Generation KC papers . 5 weeks free insurance . Flead . wormed up to date . 1st vaccine . Microchip . Puppy pack . blanket. toys etc. 2 blue boys with white chests. .1600 1 blue brindle boy .1200 1 blue girl with white chest. .1600 1 solid blue girl. .1600 We ask for a non refundable deposit of .400 to secure your pup. .Please note. Due to the growing number of puppy thefts. we have 24 hour CCTV in operation. Calls or texts welcome .telephone removed.5 Based in Rayleigh in Essex. Sensible Offers welcome.